At the last SQLPort event in December 2014, I have listened to a presentation by Alberto Ferrari talking about DAX and giving some tuning advices regarding the Date Dimensions in xVelocity storage engine (PowerPivot, SSAS Tabular). Since the same base principle & engine is used in the heart of Columnstore indexes, whole thoughts lead me on to doing some research related to the Dates usage in Columnstore Indexes. For this blog post I decided to experiment with some datetime data – to see what happens with the compression on the storage level and how some of the basic queries will be effected. I have choosen to create 4 different tables with different way of storing DateTime data: DateTime column(1), Date column & Time column(2), Character column(3), Integer column(4). For the principle test table I have used the dates from dbo.FactOnlineSales table, joining them together with the random times generated in the previous step for dbo.Times table. I decided to put DateTime data into a string column, to see how it will compress compared to the DateTime and how it will perform with my test queries. I know enough people and I have seen way too many times people choosing the wrong data types and understanding some of the implications is extremely important, because granting that this might bring some advantages does not mean that there are no clear disadvantages of selecting a “wrong” data type. Notice that with VarChar would simply get worse, especially with the Memory Grants for the queries, which are attributed calculated that Varchar fields are half-full, which a lot of times leads into the problems of TempDB Spilling. To get a better view I have decided to include a BigInt data into the test, converting the DateTime data into a big integer value (I would be able to use a simple Integer if my data would not have seconds involved). 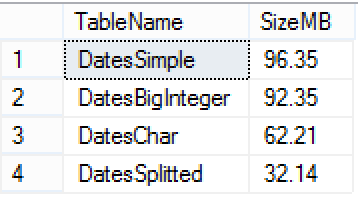 You can see the difference in the sizes with DateSplitted occupying 1/3 of the size from the original DatesSimple table. Depending on the data, I have actually seen it going as low as being 5 times smaller, it all depends on the actual information. Separating date from time guarantees that we can compress the Dates much better in the cases when they have the same values stored. The same applies to the Times column, where having equal values means much greater level of compression. From the other side BigInteger seems to compress data quite similarly to DateTime, which makes enough sense since both data types occupy 8 bytes of space. The difference for the dbo.DatesChar table is clearly provoked by better compression technics applied to the character fields within Columnstore engine. The result from the storage perspective is very clear – splitting date & time into 2 columns pays off greatly, and storing data in character form in the current (SQL Server 2014) gives a number of advantages relative to the compression. We have seen data storage variation depending on the method, but now let’s see how it behaves whenever we are extracting and processing data. The clear winner here is the default storage engine (DateTime), performing the best without any tweeks, with BigInteger following by a minor delay and than with huge gap of ~3.5 times slower the table with Date & Times separated into 2 different columns (dbo.DatesSplitted), finished by the slowest by far dbo.DatesChar table is using Character data type for DateTime storage. 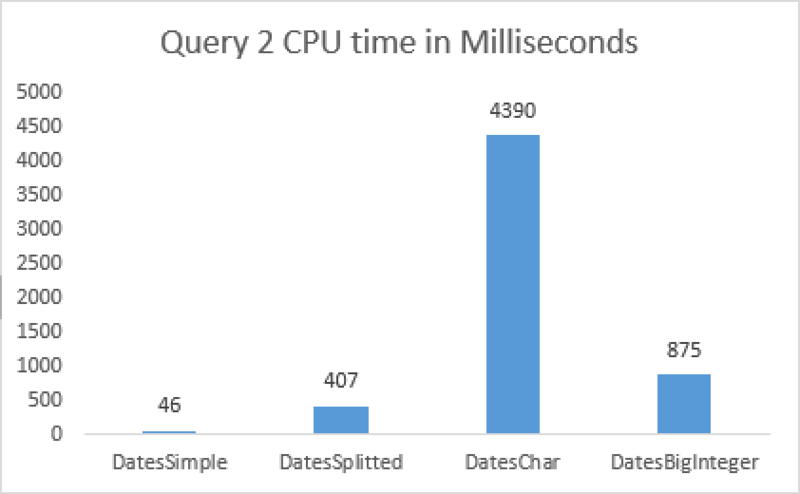 In the case where the major number of queries are scanning whole FactTable on the fast storage, there is no doubt that splitting DateTime into 2 columns does not make a lot of sense. This picture would not be complete without spent CPU times – here you can clearly see that the pattern of the total time behaves in correspondence to the CPU times – which in this case means that we are simply spending our CPU power on processing data. Notice that those results will be very different depending on the storage, if we would be scanning large TB of data on a storage that is slow, than our resources spending pattern would definitely change. The results follow the pattern of the 1st query results, with quite notable difference of BigInteger performing extremely slow compared to the previous results. In all this looks more like a bug and I am definitely submitting a Connect Item on it. 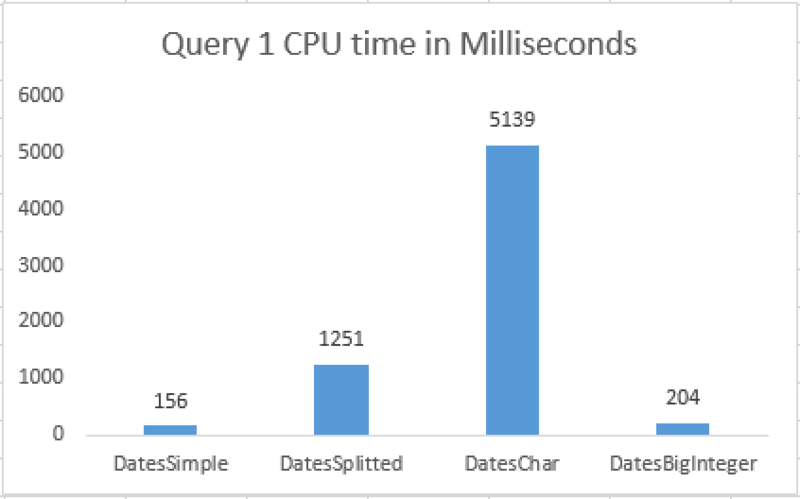 The amount of data read in the query for DatesBigInteger is smaller and so it should be running at least as fast as the full table scan. CPU time = 78 ms,  elapsed time = 105 ms. 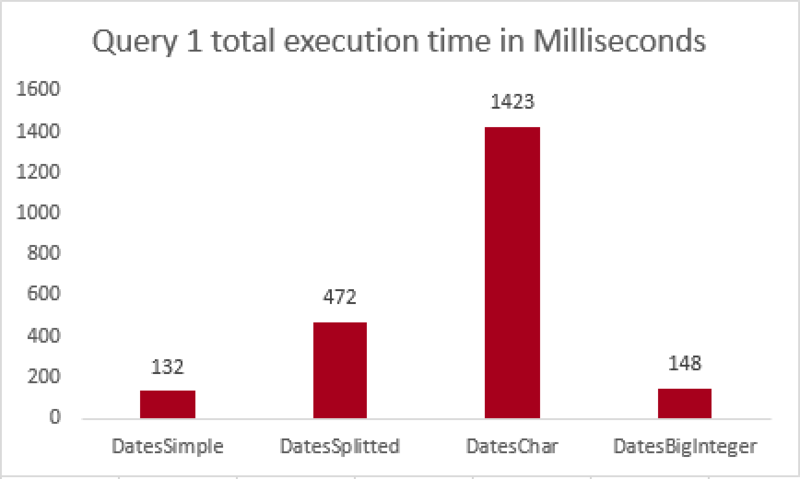 The difference between using 1 DateTime column or 2 columns separated into Date & Time, is getting smaller - most probably because of more efficient Segment elimination. 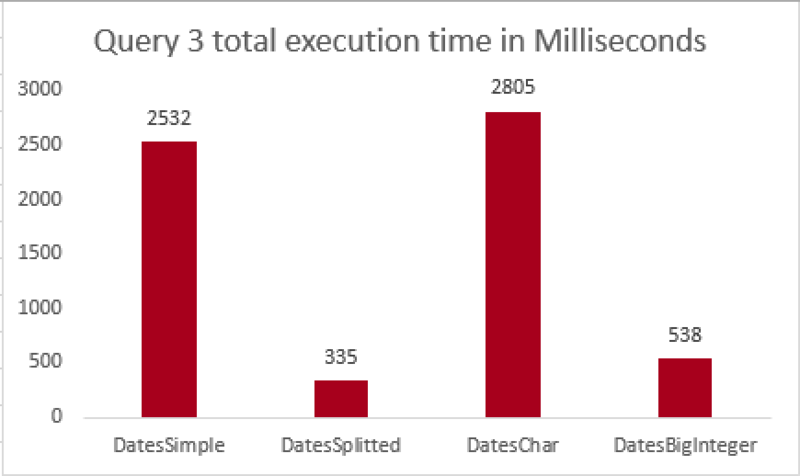 Once again, the CPU time is actually setting the pattern for the total execution time. The Character processing is extremely slow on the CPU side and I do not really even a slow storage to compensate it easily. Naturally everything needs to be proven and tested, but for the current set of data I can clearly see that sticking to the default DateTime configuration is still the best option. 1. 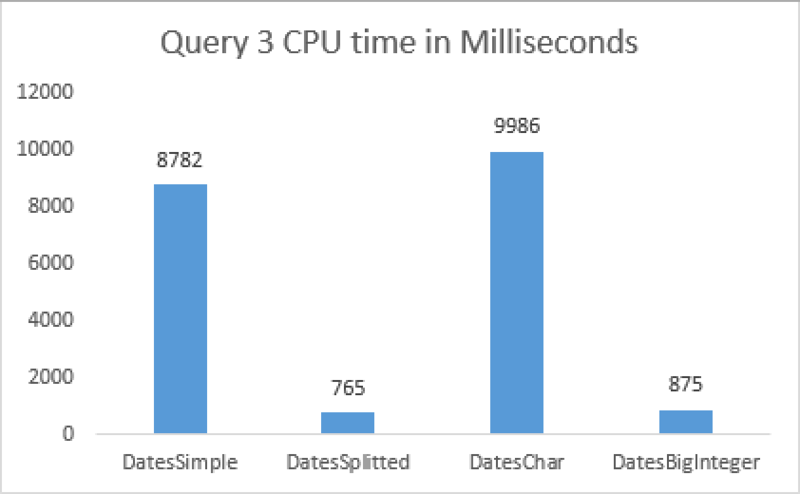 The performance problems of the DatesSplitted table are related to Compute Scalar iterator - we are doing max over casting of 2 different columns, and should remove those complex calculations (which are needed for the logic in this case) than our query times would easily drop to 19 ms of total duration and 32 ms CPU time respectively. If there is a logic involving complex calculations of date & time conjunction, than there might be no win in splitting the column, but should we just use Date & Time as a predicate - it might be very interesting. 2. In the case of DatesCharacter performance - we are simply not filtering the data on the storage level - the predicate is not being pushed down, as you can judge on the presence of Filter iterator and the number of rows being transferred from the Clustered Columnstore Index scan. This is a known limitation for SQL Server 2012 & 2014 and I can only hope that in the future it will get updated & improved. Since the information about min & max data stored inside segment is not exposed for the Character columns, there is no reason to push down the predicate. 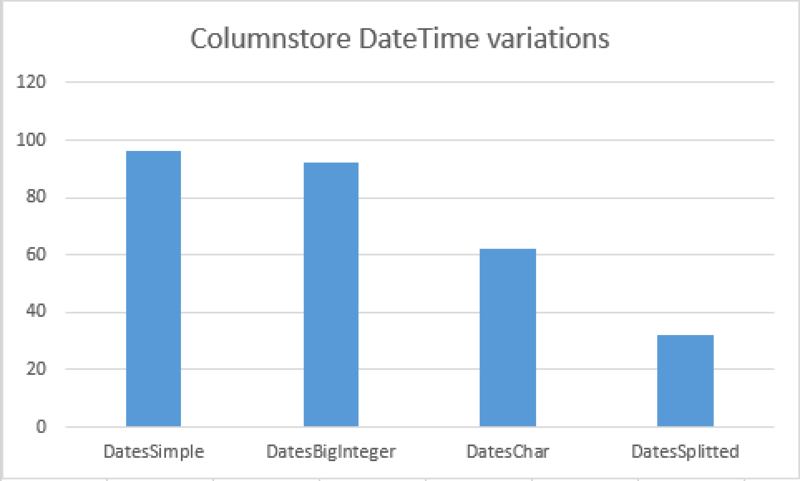 As you can see the results are very clear with Date & Time splitted into 2 columns are leading the way together with BigInteger table, while DateTime & Character based column tables are trailing with a performance almost 10 times slower. 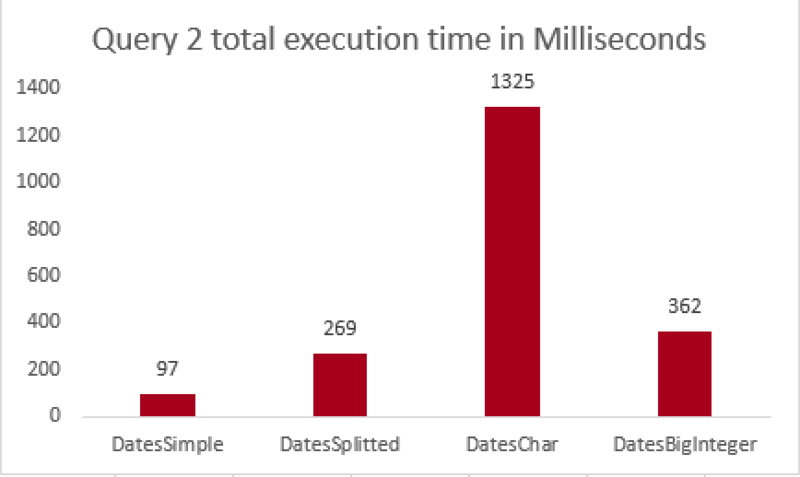 While it is still largely depends on the concrete situation, if achieving the best compression and great balanced performance are extremely important points, and if you can apply changes to your queries without any big problems (maybe creating a view) - then you should consider splitting DateTime columns into 2 columns with Date & Time datatypes. As long as Character columns do not support Segment elimination on the storage level, there are no reasons to use them, unless you are intending to scan the whole table - then its better compression might be something to consider. thank you for the comment and explanations – it makes total sense. I just tested your suggestion and it works as described. when filtering for times between 9:00 and 18:00 you should use DATEPART(HOUR, DateKey) BETWEEN 9 AND 18 on the dbo.DatesSimple (native DateTime columns). This would reduce the CPU time by 40 – 50 %. Drawback: works only for full hours. On the other side even a DATEPART(HOUR, DateKey) * 100 + DATEPART(MINUTE, DateKey) BETWEEN 915 AND 1830 would reduce the CPU by ~25 %. Using CONVERT(VARCHAR, tww.geaendert_am, 108) BETWEEN ’09:00:00′ AND ’18:00:00′ would have only a minimal benefit.